This is the third of five posts about LittleBigPlanet. My first post dealt with the mechanics and deconstructionist nature of the game and my second post addressed the game's cooperative appeal. This post is somewhat related, and I will share some thoughts about communication in LittleBigPlanet. As always, feel free to jump in with your thoughts. Last night, I decided to take a break from my diligent blogging and fire up LBP (for research purposes, of course). I chose "quick play," which drops the player into a level with a group of random folks. I popped out of the entrance to find two other players waiting. I heard no voices, and I was not using a microphone, so I put on Sackboy's happy face and waved at them. "All right," I thought, "Let's get ready to rock!" One of the other players opened his menu and began typing out a message. A speech bubble popped up, written in Japanese. The second player pops up a second message, also in Japanese. I brought up my cumbersome, mobile-phone style typing pad and pecked out "speak english?" I shook Sackboy's head "no," and made a sad face. I noticed a fourth person had joined the group. He must have been watching our interaction, because he typed in "Hablo Espanol." "Well this should be interesting," I sighed. Fifteen minutes and three successful four-player puzzles later, I exclaimed, "Well THAT was interesting!" LBP's on-line structure does not separate people by region, so the chances are good that people who do not speak the same language will find themselves needing to communicate in order to accomplish a goal. My opening anecdote illustrates that, despite having a group of four people and three languages, communication and cooperation is still possible. Cooperation and communication is still possible due to visual communication and body language. Although Sackboy is in most ways the quintessential platformer, he has one important attribute that sets him apart from most video game characters that allows for non-traditional in-game communication: Sackboy is extremely animated. 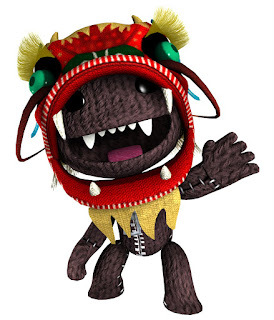 When I first started playing LBP, I was amused and confused by Sackboy's customizable nature. Why would Sackboy need 10 different facial expressions? Why could I tilt his head and body with the controller? What is the point of allowing each of his arms to move independently? And why would any character need so many different skins and outfits if they did not impact hisabilities? The answer: LBP builds communication into the character, rather than making it emanate solely from the player. Playing LBP on-line without a mic, keyboard, or common language is accomplished by interpreting action and body language. Using hand gestures to direct people through puzzles and nodding to affirm level selections overcome technological and linguistic barriers. Discerning the intentions and attitudes of my fellow players becomes a fun meta-game while playing on-line with strangers. I take a look at their costume to learn about their taste in clothing, which often corresponds with their temperaments. Why is it that people dressed like ninjas always seem to be great players? Some people get agitated if the team is not making fast progress, and begin hopping around with scowl on their face. Others smile and wave at encouragingly. Some players like to direct traffic during puzzle segments while others are content to follow the leader when exploring. At times, gestures and body cues break down and communication happens physically: dragging someone onto a switch or smacking a person who seems to have dozed off are common sights. I did not come in to the game expecting to enjoy talking with a bunch of strangers. However, LBP's non-verbal communication set it apart from other games, and gave me a greater sense of immersion than talking ever could have. The universe of LBP is one in which actions take the place of words. I was trying to think of a game that has similar communication build into the characters and I could only think of MMOs, which make sense considering those games are all about interaction. But seeing in a tactical shooter might be nice. Also, I really love emoting, perhaps more than is healthy. The more /emote things I can do the happier I am and finding ways I can express myself through my character is a joy. The first thing that comes to mind reading this is that, well, perhaps Home is trying for something similar? Maybe not through animated expressions like nodding with a smile, but the general idea behind it does seem similar after reading about both LBP and Home. Then again, Home is also trying to appeal to the social networking crowd isn't it so maybe not. Thank you for these posts on the game though, I was quite surprised to see such little discussion on the game after it released. Sure there were one or two articles here and there, but I definitely expected much more than what took place. Seeing people like you provide that discussion is great and I appreciate it. Oh "Home," where to start? One of the biggest problems I see with home is its lack of any specific goal. One of the reasons why LBP's communication succeeds is that people are working towards something, rather than just hanging sexually harassing each other. Thanks for share this information, i just know about that,and will get advantage from this,Thanks for share this. EXP Podcast #6 - Year-end Roundup! December '08 Round Table: The Future is Now!